See Portland’s best sights and the spectacular natural beauty of the nearby Columbia River Gorge with this combo tour. Use your 2-day hop-on hop-off sightseeing trolley pass to explore top Portland attractions such as the International Rose Test Garden, Powell’s City of Books and the Oregon Zoo at your leisure. On your tour of Oregon’s picturesque Columbia River Gorge, visit towering Multnomah Falls and Bonneville Dam and travel back to Portland in the footsteps of famed explorers Lewis and Clark. With a mix of independent and guided sightseeing, this combo tour is a wonderful introduction to the Portland area. Enjoy a narrated 1.5-hour tour of Portland on a sightseeing trolley, hopping on and off as you wish at the 11 stops (see Itinerary for a full list of stops). Your trolley pass is valid for two days, so there’s no need to rush. See why Portland is nicknamed ‘Rose City’ at the gloriously colorful and fragrant International Rose Test Garden in Washington Park. Fall in love with the herd of Asian elephants at the Oregon Zoo, and lose yourself among the endless shelves at Powell’s City of Books, the world’s largest independent new and used bookstore. Your trolley pass also makes it easy to see the city’s historic buildings, interactive science museum and trendy shops. Plus, a portion of all ticket sales goes toward breast cancer awareness and research. Also included in your combo is a captivating 4.5-hour tour of the Columbia River Gorge, a long, gorgeous canyon stretching through the Cascade Range. You can take this tour before, after, or during the course of your two-day hop-on hop-off trolley pass -- the choice is yours. From downtown Portland, travel by coach along the winding Historic Columbia River Highway, taking in placid green hills and the impressive Columbia River as your driver provides commentary. After stopping for panoramic views from the Vista House at Crown Point, loop down to Latourell Falls, a waterfall that dramatically plunges against a backdrop of massive rocks. Take your fill of photos before continuing your drive past Wahkeena Falls. 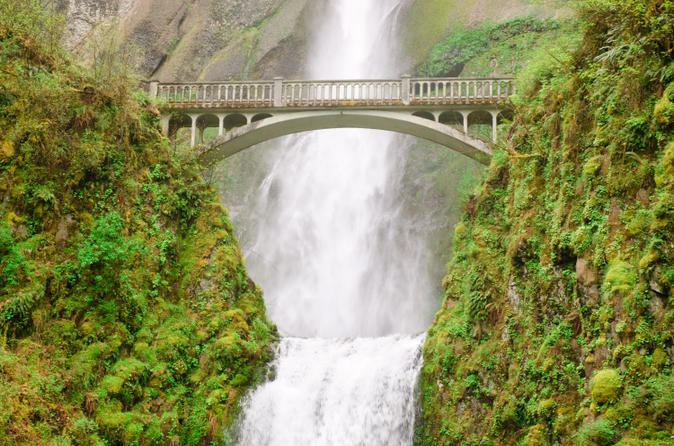 Your next stop is Oregon’s most popular natural attraction, Multnomah Falls and Lodge. The tallest waterfall in Oregon at roughly 620 feet (189 meters), magnificent Multnomah Falls has two stunning tiers and numerous scenic overlooks, and the lodge houses an interpretive center and gift shop. Take in more natural splendor as you pass Oneonta Gorge and Horsetail Falls on your way to Bonneville Dam in the heart of the Columbia River Gorge National Scenic Area. In summer, marvel at the remarkable sight of thousands of salmon and steelhead swimming upstream along a fish ladder to navigate the dam. On your return trip to Portland, follow the river-level route that the Lewis and Clark Expedition took more than 200 years ago as they made their way toward the Pacific Ocean. You’ll see landmarks that these two famous explorers documented on their epic journey, including Beacon Rock, Cape Horn and Rooster Rock.